The UT-HZ boiler type ensures a reliable and efficient heat supply in the high output range. The Unimat UT-HZ hot water boiler is a shell boiler in 3-pass design with two completely separate flame tubes and flue gas passages. 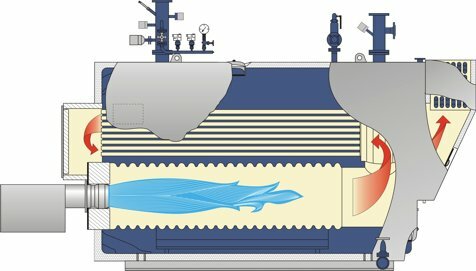 This double-flame tube/smoke tube boiler has been in use for decades and is built with separate flue gas passages. This means it is suitable for operation with just one burner. The UNIMAT UT-HZ hot water boiler is deployed in all areas where very large amounts of heat are required. The main areas of use are district heating generation and the processing industry. Its suitability for unrestricted parallel or single burner operation is not only due to the stable separation of the components on the flue gas side. The special design features for neutralising the tension forces in single-flame operation are also critical for ensuring long-term stability. The flame tubes are continuous in the front and rear floors and welded securely all around. 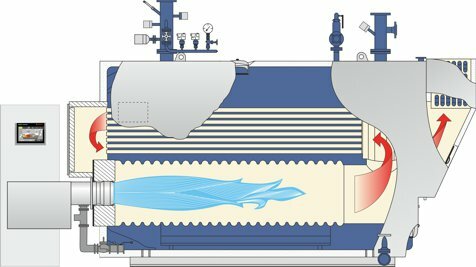 The water-flushed rear flue gas reversing chamber is divided by a stabilising tube wall through which water flows. It is also anchored to the rear floor. The large pressure relief surfaces together with the reversing chamber ceiling floor anchoring keep stress loads at a low level. The boiler's unrestricted suitability for single-flame operation provides a large degree of flexibility in terms of loads. It results in a doubling of the boiler's adjustment range, allowing reductions in unnecessary energy loss. All of our shell boilers are supplied inclusive of all equipment, i.e. as fully functional units. The basic equipment includes the boiler pressure vessel, the control and safety technology, the burner unit, a terminal box and the control cabinet including our easy-to-operate BCO boiler control.